Routledge provides a compelling account of Neave's experiences in Nazi-dominated Europe. In 1941, he escaped from a prison camp in western Poland, making for the Soviet occupied zone. He was recaptured and sent to the infamous Colditz Castle, where the Germans unwisely collected the most incorrigible escapers from across Europe, making it into a veritable university of jailbreaking. Neave got away at the second attempt in January 1942, making his way across Germany to Switzerland, the beginning of a 'ratline' of helpers which shepherded him across Vichy France and Franco's Spain to Gibraltar. Neave would soon play a key role in managing the ratlines as an agent for MI9, an offshoot of MI6 charged with helping escapers. The allied invasion of Europe would see him scouring France with the SAS for fugitive allied servicemen. After the war Neave was involved in tracking down German war criminals. He served the indictments at the Nuremburg trials, and Routledge provides a memorable account of his impressions of the top Nazis. At the same time, the British-sponsored wartime resistance networks were evolving into NATO's anti-communist stay-behind network Gladio. 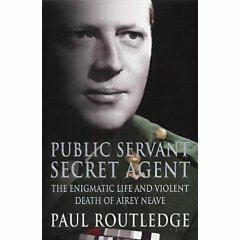 Although he says little concrete about this mysterious organisation, Routledge is clear that Neave was involved in this work and retained links to MI6 and the SAS throughout his life. Neave's subsequent career as a Tory MP in the 1950s and 60s, was to all appearances unremarkable, notable chiefly for his successful books about his wartime experiences. In 1959, a heart attack cut short his ministerial career in a manner that led to a fateful falling out with the Conservative chief whip Edward Heath. As a backbencher, Neave's main interest lay in defence-related technology, often in areas that overlapped with his business interests, such as the development of the Blue Streak rocket. Neave's intelligence background would com to the fore again in the mid-1970s, when he managed Margaret Thatcher's campaign to become leader of the Conservative Party. In an acute piece of disinformation, Neave underplayed her support, forcing Heath's opponents to unite behind her in the first ballot, establishing unstoppable momentum. There was also a more sinister side to Neave's political manouvres during this period. He was closely associated with the right-wing circles that were plotting to bring down Harold Wilson, through his associations with men like George Kennedy Young, David Stirling and Peter Wright. Neave's most direct connection to the plot was through his 1976 approach to Colin Wallace, the sacked former army press officer. Wallace had worked on the Clockwork Orange disinformation campaign,which had originally been directed at the IRA, but which had come to include British politicians among its targets. Wallace, who provided Neave with material for articles and speeches, later concluded that he had been used by the intelligence services as a deniable source for the black propaganda. The Clockwork Orange episode illustrates the way in which the Irish Troubles were becoming increasingly bound-up with Westminster political intrigue at this time. Neave had little experience of Ireland up this point. It was his intelligence contacts that prompted Thatcher to make him shadow Northern Ireland Secretary. A hardline Tory Northern Ireland spokesman was an obvious target for republicans, who may also have feared that Neave was uniquely placed to understand the role of prisoners in the republican struggle. He was killed by an INLA car-bomb at the Palace of Westminster on 30 March 1979, only two days after the collapse of the Callaghan government. After cultivating contacts with the IRSP, Routledge was able to speak to one of the INLA volunteers involved in 2001. He was told that Neave had been put under surveillance by an English sympathiser, and that the bomb had been placed outside his flat by a team of one-off volunteers without penetrating Westminster security, in contrast to previous INLA accounts. Naturally, the INLA's version has no place for the various alternative conspiracy theories about the killing, which Routledge nevertheless discusses fully. Enoch Powell believed that MI6 and the CIA murdered Neave to pave the way for a united Ireland within NATO. Irish journalist Kevin Cahill claims that Neave told him that he was going to clean up corruption in the security services, and that this intention led to his murder, that of Sir Richard Sykes and an attempt on the life of Christopher Tugendhat. Gerald James, the former head of arms firm Astra, holds to a similar theory. Powell's claim is intriguing in the light of later events, but as Routledge points out, the most obvious rogue elements in the security services were those closest to Neave himself. There are also indications that Neave was on good terms with the CIA. Routledge quotes an anonymous Tory source who points to Thatcher's visit to the US in September 1976, accompanied by Neave, as the point at which rumours emerged linking Harold Wilson to the KGB. This source may well be one of the interviewees from the BBC's 2006 Wilson Plot documentary, which revealed that Thatcher had contacts with the CIA's former counter-intelligence chief James Angleton. Neave was surely involved. While the theories are intriguing, there is no real evidence that Neave was killed by anyone other than the INLA. In the years that followed, the INLA and its political wing the IRSP was the target of a series of assassinations more devastating than anything inflicted on any other paramilitary group of the Troubles. If this was the secret state avenging one of its own, the chosen method avoided a public trial. What seems certain is that the Irish Troubles and British covert politics came together in an explosive way in the mid-1970s. The old war hero Airey Neave was a central figure in that alignment, which would cost him his life, but not before he had exercised a decisive influence on politics in these islands for decades to come. Paul Routledge provides some fascinating insights into this many-sided figure. His account will be of interest to readers across the political spectrum.